We love winter sports and the fun and adventure of skiing and snowboarding. There’s nothing like the rush of sailing down a mountain on a brisk winter day. The good news is that the advent of releasable bindings has reduced the risk of breaking a leg. But, in spite of skiing and snowboarding becoming safer overall, other injuries are on the rise. The best way to avoid injury is by applying common-sense practices and fitting in some pre-season conditioning with help from your physical therapist. What Are the Most Common Injuries for Skiers and Snowboarders? A study by the National Ski Areas Association showed that, in general, skiers hurt their legs while snowboarders hurt their arms. Knee injuries are at the top of the list for skiers, and thigh, lower leg and ankle injuries are also common. 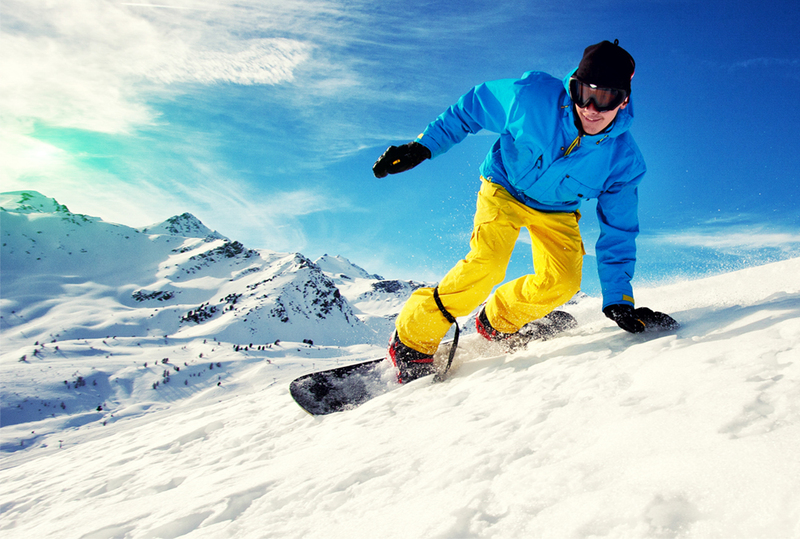 For snowboarders, because of the lack of leg mobility, the upper extremities are at greater risk. Wrist injuries are the big one, especially for novices as they get their bearings, but elbow and arm injuries are also a big concern for snowboarders. Knee sprains are one of the most common problems for skiers. According to the American Physical Therapy Association, ACL (anterior cruciate ligament) and MCL (medial collateral ligament) tears related to skiing are on the rise. Injuries to the MCL ligament on the inner side of the knee are common in beginner skiers and often happen when skiers are turning skis in for the so-called snow plow position to stop. The ACL ligament, right in the middle of the knee, is more likely to be injured during high-impact activity, and according to APTA often occurs while landing jumps and trying to prevent falls on the slopes. With two legs on one board, snowboarders have less ability to catch falls with their legs than skiers, according to Brigham and Women’s Hospital. So it’s natural, especially for newer snowboarders to try to break falls with their arms, impacting their wrists. However, in many cases, those falls can be prevented in the first place by conditioning legs and core muscles. We also recommend increasing cardiovascular endurance with aerobic exercise like treadmill and bicycle to help you stay fit and avoid tiring out easily. Avoid taking on too much too soon. Instead, stick with terrain that’s comfortable and work your way very gradually to more difficult terrain and jumps. Taking lessons before hitting the slopes on your own is another excellent way to learn to ski and snowboard safely. Don’t try to prevent unavoidable falls. Instead, learn how to fall the right way to avoid injury. This includes learning how to turn your body on skis and breaking the habit of stretching out your arms to break your fall while snowboarding. Know when to call it a day. Someone with a ski or snowboard injury often starts their story with “I just wanted to do one more run.” When you’re tired, you don’t react as quickly, you get sloppy with your technique and you are more prone to fall. Better to end on a good note and hit the slopes again when you’re fresh and rested. Many patients don’t realize that physical therapists are available not only to help you recover from injuries but also to help prevent them. Injury prevention is a key part of any physical therapy practice. At Countryside Orthopaedics & Physical Therapy, our skilled therapists can help you design a personalized program to help you get ready for your favorite winter sports, building strength and endurance to give you confidence on the slopes. We’d much rather see you in our PT practice getting in condition for the winter sports season than in our ortho practice after a fall.